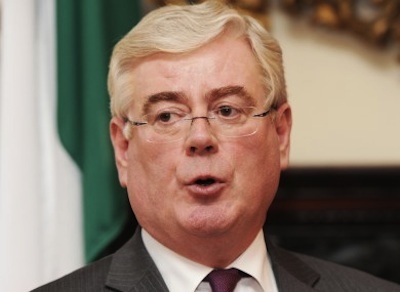 Eamon Gilmore made a speech in Cambridge at the weekend to the British-Irish association. It made depressing reading for a number of reasons. As minister of Foreign Affairs he’s supposed to be the man in the Irish government dealing with the North yet there’s only one word for this speech, the longest he’s made about this place since he took office, and that word is vacuous. The Irish Times, a paper that has no northern nationalist voice among its columnists, got all excited with Gilmore’s remarks about the need to acknowledge unionists’ ‘perception’ that the Irish government hadn’t done enough to deal with the IRA during the Troubles. Correctly no-one else in the south paid a blind bit of notice because the remarks were devoid of specifics as indeed was his whole speech. Nevertheless the general tone and content were those of a man who has no feel for the North. During the whole of the tangled web of his political career from Sinn Fein, The Workers Party, through Workers Party, Democratic left and Labor Gilmore has been wrong on the North. Then again he was wrong on everything else, apparently perceiving virtue in east Germany and Ceausescu’s Romania invisible to most of the world who recognised dictatorships when they saw them. Now he is the nick Clegg of Irish politics, having abandoned fundamental promises his party made before the last election and watching his party haemorrhage TDs and councillors as it plummets in the opinion polls. His speech on the north shows you can’t see the join between Labour and their Blueshirt partners in this coalition. Perhaps his most outrageous claim was the need to ‘reassert’ the role of the two governments as co-guarantors of the Good Friday agreement. Exactly how? You have to admire Gilmore’s nerve. This is a guy who during his tenure at Foreign affairs has done virtually nothing to promote the role of the Irish government here. Thanks to him and to the stupidity of Sinn Fein in the North the Irish government had no input whatsoever into the ‘economic Pact’ announced in Downing Street in June. That was the first occasion since 1985 that the Irish government was not involved in such a project, despite the fact that there could have been substantial cross-border benefits. It was amazing to nationalists that after a year of unionist flag protests, riots injuring hundreds of police, provocative marches past Catholic Churches and flashpoints like Ardoyne by bands extolling the exploits of loyalist killers, the only criticism Gilmore had to make was to parrot the words of our clueless proconsul and attack Sinn Fein for its march in Castlederg. Nothing like a bit of balance eh? You can’t help but wonder is Gilmore fighting old Stickie/ Provo battles or just electioneering for a Southern audience? The most serious criticism of his role as co-guarantor of the GFA [ Good Friday Agreement] is that for the first time on matters of critical importance there’s a conference beginning next week chaired by Richard Haass in which the Irish government has no formal role. Gilmore allowed that to happen. The British government will have to implement any proposals on flags or the past by introducing new legislation or amending existing law. Has the Irish government no input into which symbols and emblems are displayed as of right in the North? Does the Irish government have no contribution to make about dealing with the past other than vacuous talk about unionist ‘perceptions’? Had the British government no role the Irish government wishes to examine, like maybe in the Dublin/Monaghan bombs, the official documents of which Blair and Brown refused to release? Clearly not as far as Gilmore is concerned. He is too keen in Stickie fashion to appease the British government and unionism. So if last Saturday’s speech is anything to go by, when Haass’s all-party talks begin next week the Irish government will stand idly by. A pity, because past experience shows that only when the two governments work together to twist the arms of their Northern client groups is there any progress. Hillsborough 2011 was the recent proof of that. Without Dublin and London, but with elections next May, what chance of progress?